Our lives weren't always so filled with so much fun and so many extremely loud days! 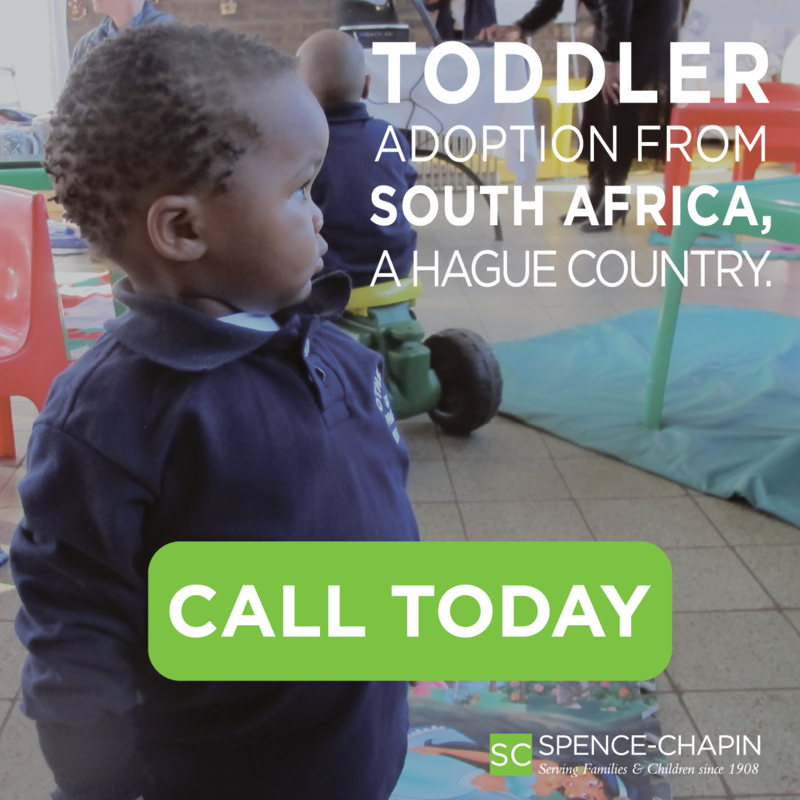 When we started the adoption process with America World in 2012, we were open to either a boy or a girl with mild medical needs. Little did we know what God had in store for us! Prayerfully, we looked at different files of some precious children. Although we viewed several children's files, my husband never quite felt at peace with the medical conditions present. It was a difficult time, and I remember shedding many tears. I was tempted to be angry with my husband, but this process challenged us to be very honest with one other, our abilities, and trust that we would make a decision that was both best for our future child and for our current family. Then one day I saw a picture of a little boy, his tongue barely sticking out, on the Waiting Children page. I was drawn to him, and I asked my husband what he thought. His file said he had a congenital heart defect, and it seemed to be minor. My husband was interested, and so we requested more info. Per the doctor's request, we asked for an update on his heart, and we received some shocking news. This sweet boys heart was in bad shape. It was scary to me and I assumed that my husband, with his desire to adopt a child with a mild medical need, wouldn't want to proceed. To my suprise, David said that he knew Everett was our son. God was about to give David and I a whole lot more laughter and joy to our lives by giving us Everett. 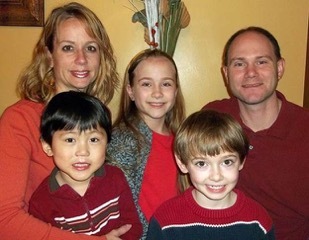 When we started the adoption process, we already had two children at home, a boy and a girl. When we brought Everett home, our son Bentley, who is a three years older than Everett, had a hard time adjusting from being the baby to being the middle child. I honestly think his adjustment would have been harder if I would have given birth again. Since Everett was already 19 months old, he could at least play some, so he was fun to interact with although Bentley was hurting inside. That first week David and I carved out extra alone time with Bentley, which helped. Our oldest cried a lot though those first few weeks while Everett soaked up attention. Everett really didn't have a hard adjustment period at all. He responded very well to the love. 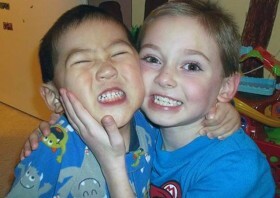 Soon Bentley began thanking God for his little brother in his prayers at night. My boys are the sweetest thing to watch play together. They wrestle, play with legos, pillow fight, and they follow each other around. It's obvious they have a strong bond. My daughter is a little mommy to these boys, and likes to boss them around and make sure their shoes are tied correctly. She also likes to read them books and have tickle fights with them. These three kids make our home lively. I never knew I would be the mom of three wonderful blessings. My daughter is beautiful on the inside and out, and my boys are rowdy, fun, and loud. There is never a dull moment around here. Everett keeps things interesting. We recently gave Everett's testimony at our church, and he came up on stage with my husband and me. Everett put his hand in the back of his pants and kept pretending to throw something out. This was in front of our entire church! I whispered to him to stop, but of course he didn't. I asked him after we got off stage what he was doing and he said he was pulling rubber duckies out of there! Who knew? Everett is amazing. He's loud, stubborn, obsessed with cars, and is everything a little boy should be. Oh, and as for his heart, he had life-saving heart surgery this summer. Six weeks in the hospital, he got the exceptional medical care he needed at John Hopkins. He is now doing fantastic and we are so grateful God brought this little boy all the way from China to us, so we could be his mom and dad. He is one of our biggest blessings. Boogers and tickle fights. Cars and mud. Sword fights and trains. We wouldn't want it any other way.